On Saturday night, we headed out to celebrate Valentine's Day - a night early. I had forgotten to book reservations until just last weekend and after finding no where I wanted to eat had reservations available had any openings, I moved to Saturday where CharBar had one opening left so we took it. It's located in the old Simmons building - along with Aviv Fried, Sidewalk Citizen and Phil + Sebastian Roasteries. They have kept the old school look on the inside and it works really well. It had been on our list for a long time so we were happy to go and finally check it out. The cocktail menu kinda scared me and was sure I would not like anything but I asked our server what they had for sweet cocktails and she recommended two. This one was called the Aerolineas. 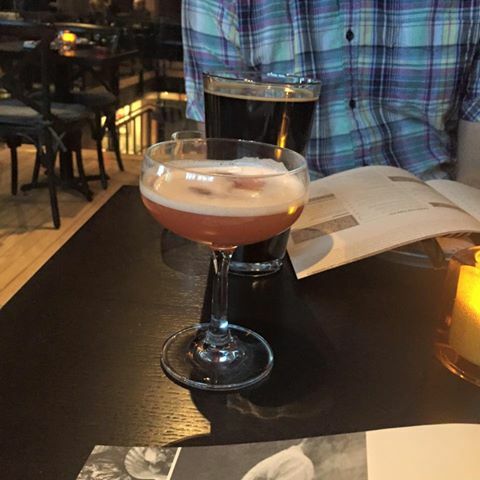 It had bulleit bourbon, aperol, lemon juice, earl grey tea syrup + amaro montenegro. I figured since it had earl grey tea syrup in it that I was bound to like it and I did. I absolutely loved it. You can enjoy CharBar by ordering a bunch of plates and sharing, ordering a meal or family style amador (I think that is what it is called). 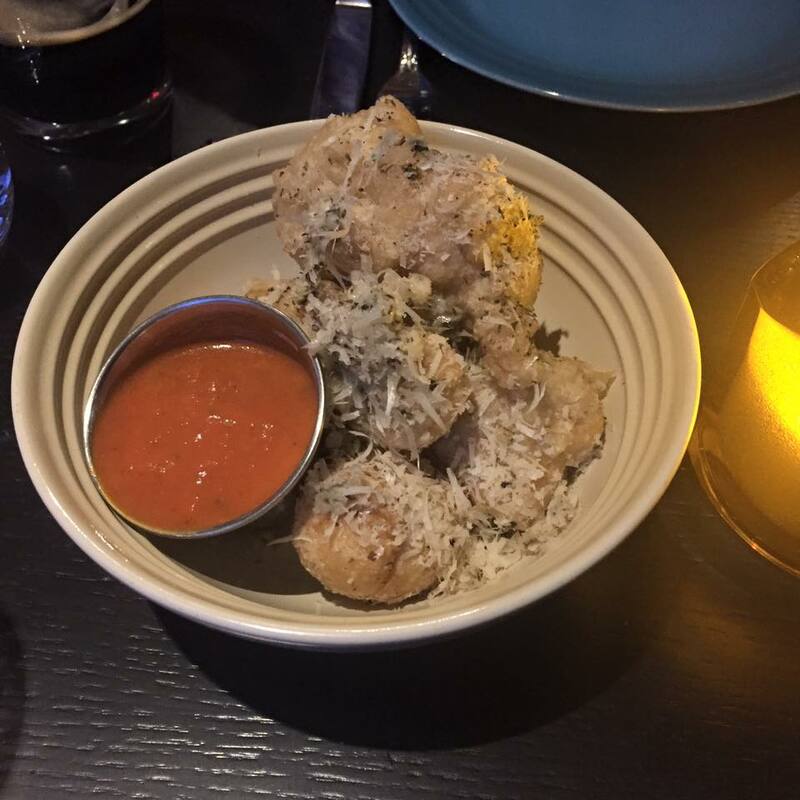 We decided to order a bunch of small plates because it is one of our favourite ways to truly experience eating good food. We always seem to remember the amazing appetizers we have eaten over any of the meals. The first thing to come out was fried sourdough balls with garlic, olive oil and oregano and I am pretty sure that was parmesan cheese on top too. They were insane. Even the tomato sauce for dipping was great and I don't typically like sauces of any kind. I would definitely recommend ordering these if you happen to find yourself at CharBar. The next thing that came out was the grilled crab and the shrimp. The shrimp were one of their specials and I don't believe is on the menu. They come with everything attached but the back is slit to make removing everything easier. I made Greg do this. They were grilled also and they were really good. 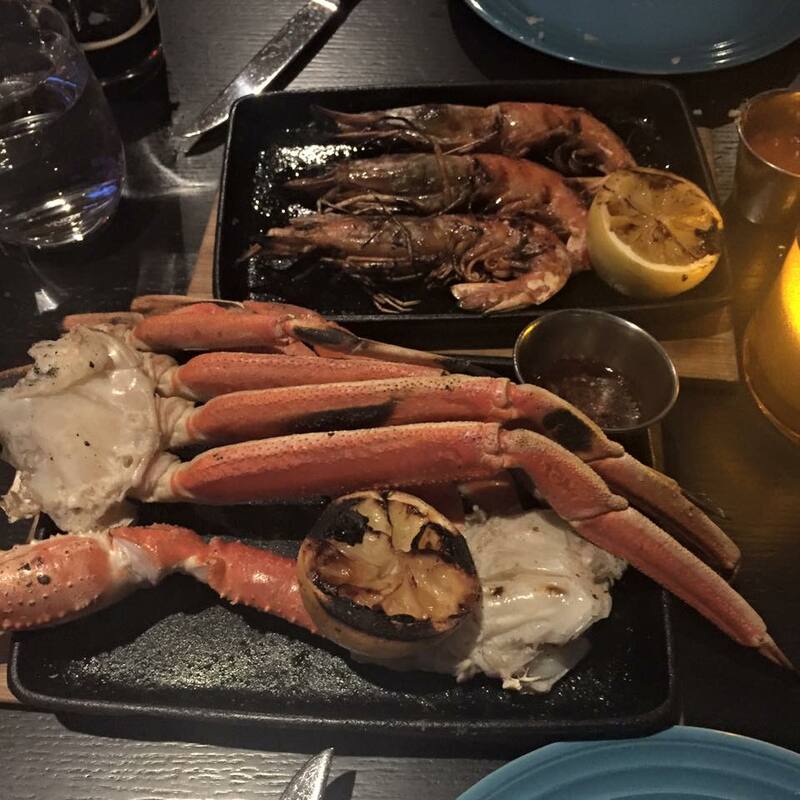 The grilled crab though was out of this world. I had only ever experienced crab steamed so having it grilled made me a little worried but it was so good. So amazingly good. 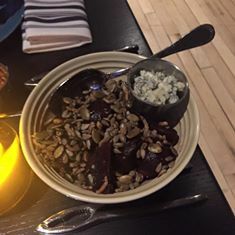 Next was roasted beets with sunflower and pumpkin seeds. They were so good. They came out nicely warmed up with a balsamic vinegar and I think sherry but I don't remember. Greg and I have a rule where we must order all the beets if it is on their menu. We have yet to be disappointed. The second drink she recommended, I also tried. It was good but not as good as the first one. 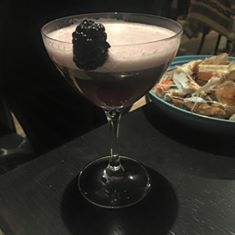 This one was called the Clover Club and contained beefeater gin, lemon juice, simple syrup, fresh berries and egg whites. The white foamy part was the egg white and I can't lie I was a little apprehensive about it but it was still pretty good. The pizza was probably the greatest pizza I have ever had. And yes I picked the cheese off but despite that it was still good. 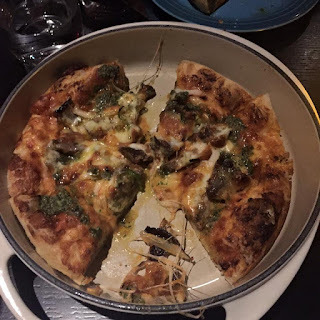 It was a braised beef chimchurri sauce pizza. The dough is made by Sidewalk Citizen and takes 3 days to make. The tomato sauce and the chimchurri sauce are also made in house. Seriously my mouth is literally watering as I type this out. It was so freaking good. This was also a special feature for the night but I am confident that any pizza you have will be as amazing. Actually anything you get there will be amazing!!! Although we both were quite full we just couldn't turn down dessert. 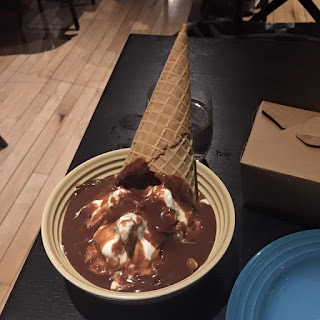 This was a chocolate sunday with chocolate ganache, sea salt marcona almonds, salted caramel, and fiasco vanilla soft serve. It was so decadent. The chocolate ganache and almonds were just the best. 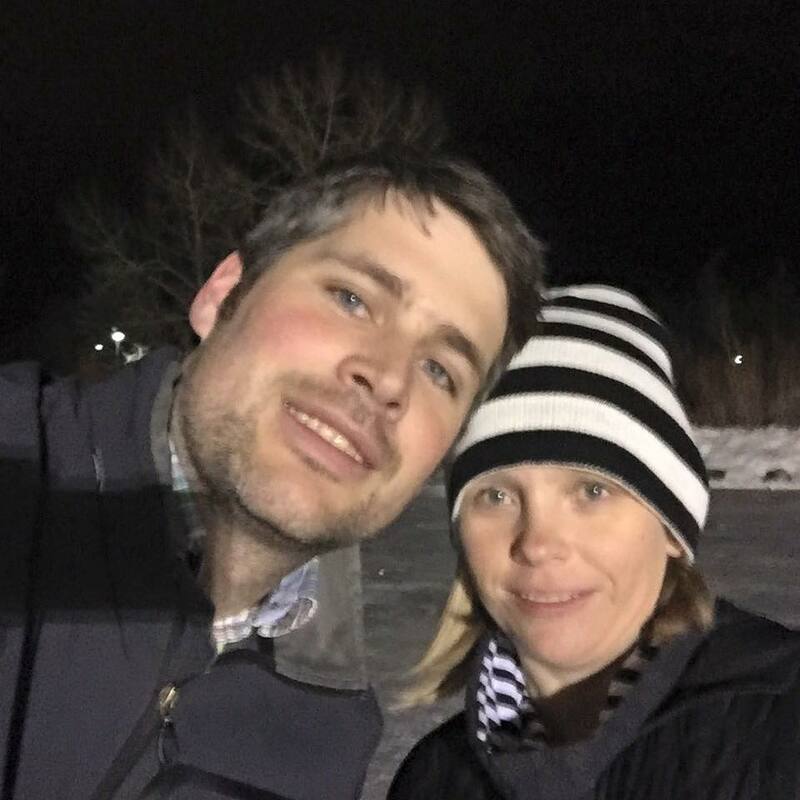 After dinner, we drove down to eau claire to go skating. It's a tradition we started last year, although last year we went to Olympic Plaza. This is where Greg and his colleagues go skating every monday and he has taken the girls here too. The dam is blocked off so there is no river water so you don't have to worry about falling through into frigid water. It's just layer upon layer of ice. We skated for about 45 minutes before I decided I was done. 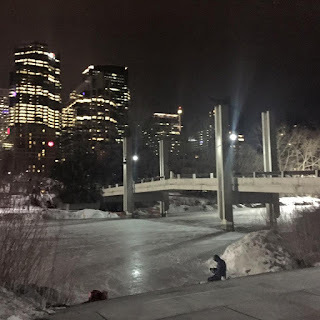 I don't particularly care for ice skating. I am not confident in my ability to skate and I had hurt my ankle/heel last week and I could kind feel it and I didn't want to not be able to run because of something dumb like skating hahaha. Plus skating hurts the shins when you only do it once per year. 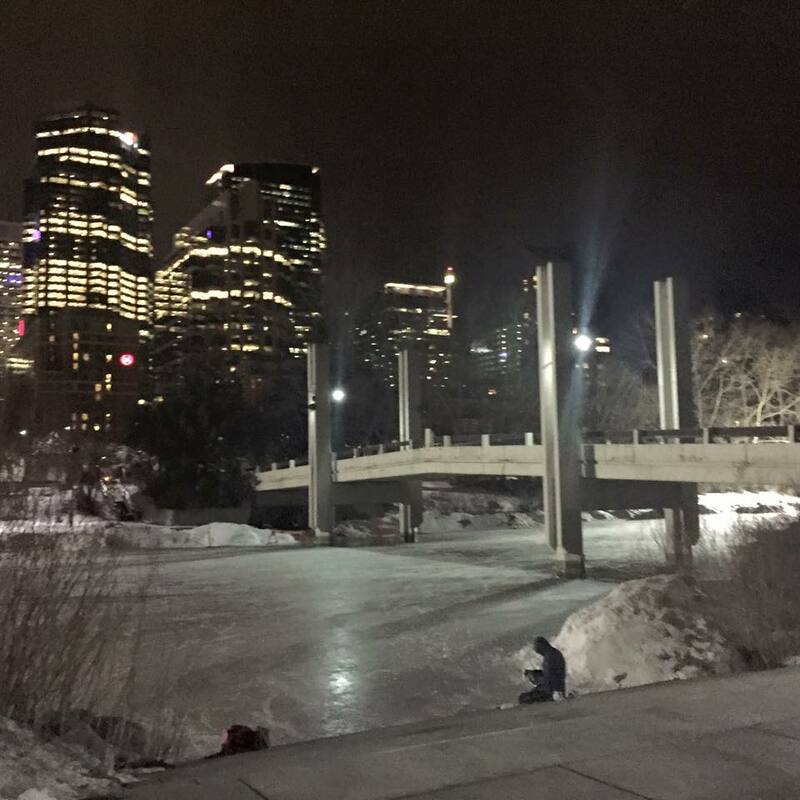 But I did enjoy skating around the river with my favourite valentine for those 45 minutes. I wanted greg to take a photo of us. I should have done it myself. He never ever takes selfies or photos of us together and for good reason. It took him forever to even hold my iPhone right and this was the best photo that he took and it is not even a great photo. Next time we try to do this, I will just do this myself hahah. My sister was visiting so she took the girls to Boston Pizza which is a tradition they seem to have.